The bergamot orange (botanical name: Citrus bergamia) is a cheery small fragrant fruit that grows in warmer climates of the world including Italy, Argentina and Brazil. 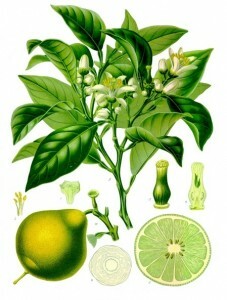 In foodstuff bergamot is used to flavour Earl Grey tea as well as confectionary and of course marmalade. Often used in perfumes (over half of all women's perfumes in fact) it has a wonderful ability to combine with other scents. Roughly 100 bergamot oranges will produce 3 ounces of bergamot oil. With this mind, think of all those orange fields needed to create the world's perfumes? From a therapeutic perspective bergamot has been used by indigenous peoples as a herbal remedy for malaria. Today, aroma therapists may use it to treat depression, stress, acne, nervousness and digestion issues. Fresh, light and uplifting bergamot essential oil is a handy oil to have around the house, especially during winter to bring a little cheer and warmth into the home through the nasal senses. Some great organic products that contain this cheery citrus oil are the Garden Mint & Bergamot Hand Lotion by Neal's Yard Remedies and the New Parent Instant Revitaliser by Natalia. You can also buy your own wee bottle of bergamot essential oil to add to your bath, oil burner or hanky for a quick and easy pick me up.